There are any number of levels on which one can appreciate this undertaking by Elevator Repair Service. Among them, the sheer ballsiness seems the most obvious. 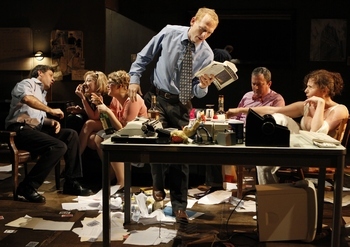 In a period in which short attention spans are viewed, often direly, as a cultural phnomenon, and the act of reading an actual book is viewed as a relic of bygone days, Gatz asks its audience to sit for six hours and fifteen minutes of theater (extended by two intermissions and a dinner break to well over eight hours) as Scott Shepherd, with fairly minor assists from his dozen colleagues, pronounces every single word of Fitzgerald's masterpiece of American literature, The Great Gatsby. And this is accomplished without uttering a single additional word that's discernible. The first question on the minds of many seems to be how one can bear to sit through an exercise of this kind. My simple answer is "I don't know," but somehow the show managed to maintain my interest and attention pretty much throughout. Two better questions, to which I also don't have answers, are how this company came to believe a project of this proportion was even possible, and how Scott Shepherd can bear to act his way through an exercise of this kind. A partial answer to the first of these questions is that this is not the only foray Elevator Repair Service has made into the verbatim Great American Novel-reading enterprise. In 2008, I reviewed their production of (just the) first part of Faulkner's The Sound and the Fury (linked below), and CurtainUp's Philadelphia page has news about the company's recent undertaking of parts of Hemingway's The Sun Also Rises. Neither is of the scale of Gatz, however, and nothing explains Scott Shepherd's ascendancy to the role of Iron Man of the Theater. All of my astonishment about Shepherd's quantitative accomplishment in this show ought not to undercut the qualitative assessment. Without his surprisingly engaging performance, it's hard to imagine this production succeeding. Likewise, as noted in Lawrence Switzky's review of the Boston production of Gatz, also linked below, the rest of the cast is "astoundingly good," While I don't disagree with his choice of Gary Wilmes and Laurena Allan as standouts, I'd quickly add Jim Fletcher and Susie Sokol to that list. What's most remarkable about this production, I suppose, is not those great performances, but the degree of success that director John Collins achieves with the ERS company in reaching the intended goal — morphing from what begins as a somewhat tedious reading of much of the first chapter of the novel in a run-down office envirnment to become an exceedingly rich theatrical depiction to the point that, by the end of the play, Scott Shepherd has transformed himself quite fully and believably into Nick Carraway, and along the way, we come to think of the various office workers very much more as Tom and Daisy, George and Myrtle, and of course Gatsby. Most incredibly, all this occurs while Scott Shepherd continues to hold his copy of the book in his hand, never letting us lose sight of the fact that he is reading it to us. While I agree with Lawrence Switzky (see link to his review in Boston) that the production is at its best in the group scenes — I especially liked the early one in Tom and Myrtle's New York hideaway and I found the play's final scenes, possessing what I consider some of the most beautiful language in American literature, to be very compelling. The production is also to be applauded for its attention to detail. This is true not only with regard to the keenly observed performances but also the design. Louisa Thompson's set details the overstuffed and shabby office to the nth degree, using doors and windows in most effective ways. Mark Barton's lighting works wonders in transporting the actors from the here-and-now to destinations of a reader's imagination, as do Colleen Werthmann's costumes and Ben Williams's soundscape. An unaccountable portion of this praise belongs to the director as well. Although I obviously enjoyed Gatz quite a lot, I would be remiss if I did not attempt to answer a tougher question. Would it be better if edited into a shorter more dramatically focused piece? My answer is, as a theatrical work, undoubtedly yes. Although the obsessive inclusion of every word of text makes for an interesting exercise, and certainly has attracted attention, it cannot be theatrically justified. I'm glad ERS did Gatz precisely as they did it: I believe it reveals something that would not have been as apparent otherwise. But I also do not think that every word of exposition and description is as precious as this approach implies, nor would I say that the approach lends itself all that well to theatrical story-telling, a fact borne out by my theater-going companion who was not very familiar with the book, and felt quite at sea through much of the show. So, while I was most pleased to see this show, I also hope that ERS does not get bogged down forever in reproducing this exercise. I've been reviewing this company for about a dozen years, and I'll repeat (verbatim) what I said about them in my first review: It takes a talented group of people to undertake this sort of project and render it both theatrical and entertaining. Elevator Repair Service brings together a group of people who have the wherewithal, stamina, spirit and awareness to make it succeed. From 9/26/10; opening 10/6/10; closing 11/28/10. You can also contact us at Curtainup at Facebook , Curtainup at Twitter and at our Blog Annex . . .